Dimitra Didangelou is a novelist and psychologist who works with writers to free their creativity. Procrastination and avoidance affect beginners and published authors alike; second-guessing and self-criticism can sabotage all of us. Join Dimitra for a workshop that focuses on overcoming the blocks that inhibit writing freely, connecting with inspiration and expressing your voice without fear of criticism. Over four hours in a friendly and supportive environment, Dimitra will guide you through expressive writing exercises, lead discussion and impart valuable tools that will make your writing practice more productive. In expressive writing we use specific writing tools and methods as developed my experts in order to express our feelings and thoughts. The approach is quite experiential and there is no wrong or right answer. Expressive writing can be practiced by anyone at any writing stage. Dimitra provided me with deeply insightful advice on the best way to proceed with the writing of a deeply personal memoir and on the struggles that come with it. 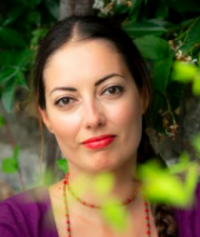 DIMITRA DIDANGELOU is a psychologist MSc, journalist and author. After filling thousands of pages for personal and professional purposes, she quickly discovered the power of the written word. Her specialization is therapeutic and expressive writing, helping people gain insight into their lives, listen to their inner voice and enhance their creativity. Alongside founding and editing a web-magazine that explores psychology, she is the founder of “Expressing MySelf”, an Institute which offers workshops promoting creative living. She loves writing fiction based on real stories because she believes that the unbelievable stories life brings in surpass even the most powerful imagination. Her training includes Advanced Study in Therapeutic Writing (The Center for Journal Writing in Denver, CO, USA), an MSc in Psychology and the Mass Media, a BA in Psychology and a Certificate in Philosophical Counseling and Psychotherapy. Dimitra is a published novelist and her short stories have been distinguished in many writing contests.